Log on to access My Genworth MI. It’s your one-stop destination for MI submissions. Whether it’s for standalone mortgage insurance, Enhanced Coverage Commitments, Contract Underwriting, or special programs like HARP, Genworth has you covered. And you can do all this knowing that your data is protected. Below are some helpful how-to articles to get you up to speed. Step-by-step guidance to walk you through our process. Delegated underwriting customers, get acquainted with Genworth’s MI submission process here. How to submit for full package MI underwriting by Genworth. Submitting loans for special programs doesn’t need to be difficult. We make it easy. 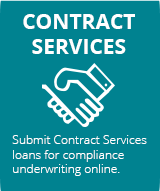 Get familiar with our Contract Underwriting submission process, and submit your loans with swift efficiency.